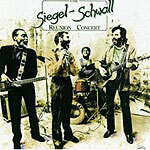 CD review: "The Reunion Concert"
The Siegel-Schwall Band was a popular Chicago blues combo in the late '60s and early '70s that had a minor hit in "I Think It Was the Wine" before disbanding 15 years ago. But unless you liked them the first time around, last year's reunion is unlikely to do much for you. Jim Schwall has an attractive, unpretentious approach to his acoustic guitar, and Corky Siegel's piano work is equally comely. But their vocals are barely tolerable  Schwall's whiny singing sounds like Jethro Burns, while Siegel's is close to David Bromberg's. "I Think It Was the Wine" is performed with verve and, judging by the crowd's reaction, went over well. For those not familiar with the band, the most appealing track is bassist Rollo Radford's lead vocal on "I Wanna Love Ya." The rest of the tracks are apparently drawn from the band's old book and, while played with energy, don't do anything to stand out from the crowd of blues bar bands across the land.